Today we’re getting real with blogging. Every time I say the word “blog” I can see the cringe on people’s faces (yes, even through the computer screen). We get it, for some, it isn’t your favorite thing. That is A-okay. But you can’t just assume you are going to escape it. Today, we are going to talk to you about why it is important, how it has been super incremental to our personal growth, and our business growth and some hints and tips for you to make it a bit easier on yourself so you can enjoy it a little bit more. People get caught up on wanting to see quick results. Like anything else, they think blogging is the quick way to see financial gain. However, blogging is not a get rich quick scheme. Blogging is a totally different world than it was five or 10 years ago. It’s an entirely different strategy with an entirely different marketing game plan, and in order to get paid from your blog, you have to have a different mindset. You must get in the mindset that blogging is 100%, straight up, no joke a long-term game. So if you are looking for some guidance and motivation to grow your blog, then this is the episode for you! Are you ready?! Before we move on, let’s just all agree, blogging is a long-term plan. But with any long-term strategy, fears tend to creep in. Like, what will you write about? Who will you write to? The best is to just give yourself the freedom to not have all the answers from day one and just start. As you do continue to blog, the more you will be able to refine what you actually want to talk about. Just because you start out in one genre or one niche does not mean that you can’t continue that same exact blog with the readership and with the foundation and just pivot your topic. When we first started out, Abagail made the commitment to blog five days a week, every single week without fail. We saw what it was doing for other businesses, and we saw the long-term effects it had. With Abagail’s background in design and marketing, she knew that simply by having more content more frequently, Google would pick the blog up more often and others would be more likely to find the site. Simply by having more content available, more frequently, the possibilities of growth were quicker and more achievable. So if you’re wanting to mimic similar results to what we saw, especially in the first few months, consider a more frequent blogging schedule. That’s like a flow chart of success right there that you just outlined. Your topics of focus really depend on what you’re targeting specifically. 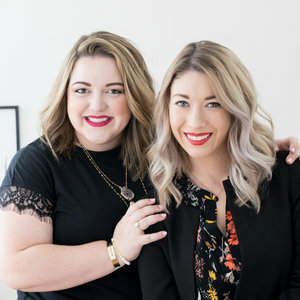 In the start of our business we focused on our design process and our photography, as well as educating one-on-one clients when they needed to hire us. However, we knew that our topic was going to change as our business changed. It eventually shifted more into education when we weren’t taking one-on-one clients any more. The topics themselves were very much focused on what we were trying to sell. The emphasis was on what we did best, and as what we did best shifted we just naturally shifted the blog content. One of the first strategies we used was to be consistent. We published our blog posts every day at the same time, and gave our audience snippets of the post on Instagram with a clear call to action. Our second attempt to get people to the blog was by sharing it on Pinterest. We had a very simple strategy where we pinned our own content. If you're not doing this, please pin your own content! Of course there are many other platforms, like Facebook and Twitter. However for us we chose to focus our efforts primarily on Instagram and Pinterest and the results really showed. The main point is that there is never just one solution that is going to make your blog successful. The next step after growing your audience is to shift them over from just the casual readers to actually being engaged followers. This can include subscribers, clients, buyers, customers; whatever makes sense for your business. One of our main tips is to start adding in content upgrades to every post to capture the readers’ email. This can be anything from a one page PDF to a complete eBook. Once you have their email address, now you can talk to them in other ways and nurture the relationship. So often we hear bloggers fall into the mindset of thinking that if they give it all away on their blog, then no one will want to buy from them in the future. The truth is, no one reads it all! We cannot stress how important giving it all away has been to our growth, personally. There is no sense in keeping it a secret because once you start. The more you share, the more people feel connected to you and feel like part of your business. Know this, it is not taking away from your potential buyer pool. It’s not limiting your opportunities. So go ahead, share all your secrets. We dare you! There are so many examples of how running a full time blog alongside your business can give you an immediate competitive edge in your industry. When potential customers see the content that you are putting out and they find it valuable, this immediately gives you a higher vantage point, putting you in a position of “expertise” in their eyes. Blogging is also a great way to answer frequently asked questions, and if clients have specific concerns, you can easily direct them to a related post. The number one mistake we see people make is publish content and then never tell anyone they’ve published it. No one will remember what you were doing, unless you hustle and put in the work in to promote what you are putting out there. Another mistake we see people making is having way too short of a blog post. When you write something that is too short for your blog, you can reuse that content and make it a meaty Instagram post instead because a couple of paragraphs that are too short for a blog are perfect for a mini-blog post on Instagram. The next mistake is having headlines that are either too dull or too spammy. Make sure to create a headline that is specific, has a hook, and describes how it can help your reader. Start a blog or pick a new schedule. Figure out what you want your opt-ins to be on the blog posts you are creating. Don't be afraid of giving it all away. Overcoming the fear of starting a blog. Blogging as a long-term strategy. Shifting your blog topic focus over time. Strategies to get new eyes on your blog. Converting readers into engaged followers. The myth of giving it all away. Blogging as a competitive edge.